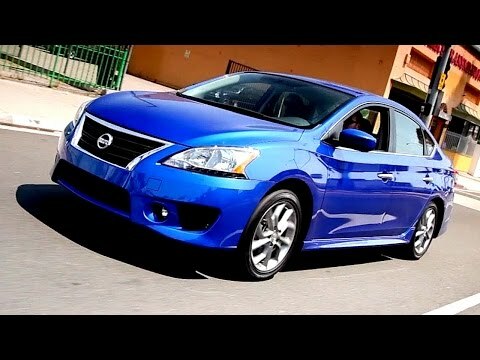 Fresh from its rebirth last year, the 2014 Nissan Sentra catapults to the front of the compact class, offering attractive styling, a long list of standard features and roomy interior. Nissan's high-tech talents are on full display in the Sentra, offering a very affordable navigation upgrade that includes apps for Google, Pandora and hands-free text messaging. Highly recommended for anyone looking for a car with plenty of legroom. I really enjoy my 2014 Nissan Sentra. I have owned this car for just under two years and have not had any major issues with it so far. I do quite a bit of driving for work and this car gets good gas mileage. I highly recommend it for anyone that does a fair amount of driving but and does not want to spend too much on gas. The 2014 Nissan Sentra also has a shocking amount of legroom in the back seats. It is a great car to use for road trips because there is plenty of room to spread out and make yourself comfortable. I am also very pleased with the amount of space there is in the trunk. I have taken this car on 8+ hour road trips and have had room to pack as much luggage as I want. You can also fit bikes in the back with a little maneuvering because the back seats fold down and open up into the trunk. My only real complaint so far is that sometimes the fuel tank gauge is a little screwy. It has a digital reading of how many more miles you can drive with the amount of gas left in the tank. The digital read of the fuel gauge seems to jump up and down by about ten miles give or take seemingly at random. When the low fuel warning turns on, the digital read will drop from 30 miles down to zero in a matter of minutes, which makes it hard to tell exactly how much further I can go before stopping for gas. The overall safety and comfort make up for what it lacks in technology. Bought the car with 32k in 2015, currently have 96k+ and have only had to fix the heat shield, aside from regular maintenance. This car is very reliable, fantastic on gas (all of my miles are highway miles and I average about 34. 6-36. 2 mpg per trip), and the seats are very comfy. Have been rear ended twice (once had to get my bumper replaced). Oh, but I almost forgot. For the first 3 years of owning this car it would stutter and make a jackhammer sound when I stepped on the gas after the break. After the third time going to my local Nissan dealership (I only take my car to Nissan for service) they figured out my transmission was shot. For three years. And no one had figured it out in the many times I brought my car in for servicing. Its just in between the growing car era so it lacks most of the accessories that came with a car in 2014 (when back up cameras because necessary, and hands free driving was more enforced). I do not have Bluetooth and I'd have to pay an arm and a leg to install it so I haven't, does not have a USB port for your phone it is the lighter jack, and it's a basic radio with am, FM, CD, AUX with six presets and an AUX outlet. My Nissan Sentra was love at first sight. I never thought I would buy a Nissan because I didn't like the older model body style. It looked too much like a typical mom car. I ended up going to the dealership where my dad bought his car so the sales person knew how picky I was before I got there. I always thought I wanted a Mazda or a Honda or even a Chevrolet but I was proved wrong. He had the 2014 Sentra ready for a test drive and I noticed the body style looked sleeker and less frumpy than what I used to associate with Nissan. The exterior does not scream mom car and neither does the interior. The fabric and shape of the seats is cool and comfortable, and durable/well made. It is just the perfect size and has an eco option which helps with saving on gas. I like how I can see the mileage count down as the tank gets lower, and I get notified if I have a tire low on air that I need to check. I have fallen in love with my car and could see myself being a lifetime Nissan driver. I will keep my eyes on what Nissan does in the future in case they come out with something even better for me to trade up into, which I do not doubt they will do. Nissan North America, Inc. (Nissan) is recalling certain model year 2013-2015 Altima and Pathfinder vehicles, 2013-2014 Nissan Sentra vehicles, 2013 INFINITI JX35 vehicles, 2014-2015 INFINITI QX60 vehicles and 2014 INFINITI QX60 Hybrid vehicles. The affected vehicles received an incorrect occupant classification system (OCS) control unit during a repair. These OCS control units may incorrectly classify the front passenger seat as empty, when it is occupied by an adult. If the OCS does not detect an adult occupant in the passenger seat, the passenger air bag would be deactivated. Failure of the passenger airbag to deploy during a crash (where deployment is warranted) could increase the risk of injury to the passenger. Nissan will notify owners, and dealers will update the OCS software, free of charge. The recall began on November 30, 2015. Owners may contact Nissan at 1-800-647-7261. Nissan North America, Inc. (Nissan) is recalling certain model year 2013-2014 Altima, LEAF, Pathfinder, and Sentra, model year 2013 NV200 (aka Taxi) and INFINITI JX35 and model year 2014 INFINITI Q50 and QX60 vehicles. In the affected vehicles, the occupant classification system (OCS) software may incorrectly classify the passenger seat as empty, when it is occupied by an adult. If the OCS does not detect an adult occupant in the passenger seat, the passenger airbag would be deactivated. Failure of the passenger airbag to deploy during a crash (where deployment is warranted) could increase the risk of injury to the passenger. Nissan will notify owners, and dealers will update the OCS software, free of charge. The recall began on April 14, 2014. Owners may contact Nissan at 1-800-647-7261. Nissan North America, Inc. (Nissan) is recalling certain 2015-2017 LEAF and 2014, 2016 and 2017 Sentra vehicles. Due to a manufacturing error within the air bag inflators, the passenger frontal air bag may not properly deploy in the event of a crash. In the event of a crash, if the front passenger air bag doesn't deploy properly, it can increase the risk of injury to passengers. Nissan will notify owners, and dealers will replace the front passenger air bag inflator, free of charge. The recall began June 7, 2017. Owners may contact Nissan customer service at 1-800-647-7261. Nissan North America, Inc. (Nissan) is recalling certain model year 2013-2016 Sentra vehicles manufactured June 4, 2012, to April 9, 2016. The front passenger seat belt bracket may become deformed if it is used to secure a Child Restraint System (CRS). The deformed seat bracket may cause the Occupant Classification System (OCS) to incorrectly classify the installed CRS, resulting in the front passenger air bag to not be turned off as designed when a CRS is in the seat. If the frontal passenger air bag deploys in the event of a crash when a child seat is installed in the front passenger seat, there will be an increased risk of injury to the child in the CRS. Nissan will notify owners, and dealers will reinforce the seat belt bracket as well as reprogram the Air Bag Control Unit (ACU) and OCS Electronic Control Unit (ECU), free of charge. The recall began on June 13, 2016. Owners are warned not to install a CRS in the front seat. Owners may contact Nissan customer service at 1-800-867-7669.